NEW PRODUCT! 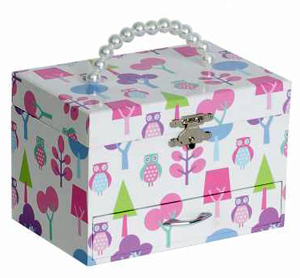 This darling jewelry box is colorfully decorated with paper in a fun retro owl design. It features an interior oval mirror and an adorable twirling ballerina. The box plays "Swan Lake" and has an open storage on top. Drawer also offers open area storage hand lined in pink sueded fabric and a silver tone latch and hardware.